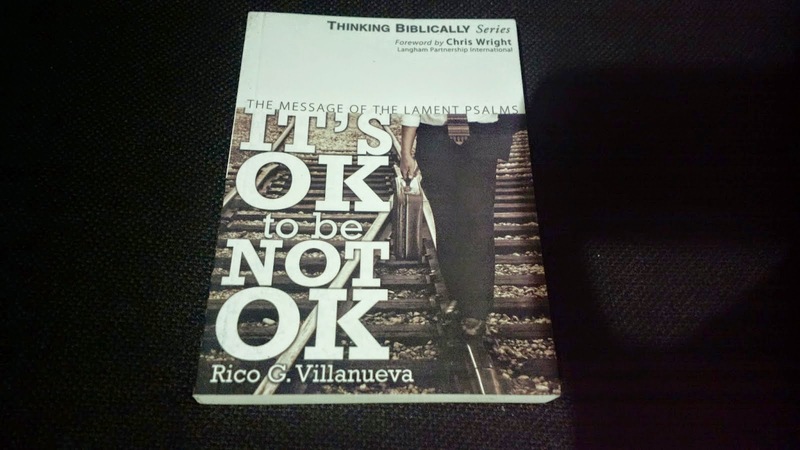 Months after I first posted about the book It's OK to be NOT OK from Rev. Rico Villanueva (who hails from Pangasinan), I was finally able to read it recently. The message had never been more timely because I was feeling down, sad, crying, afraid, struggling, angry, questioning God, and failing. Those were the exact same assurance you'll find in this book based on the message of the lament Psalms. Each of the notes above were expounded in separate chapters with each section referencing various Biblical passages which illustrate how men and women of faith in both the Old and New Testament of the Bible felt the exact same emotions at one point in time. In most cases, lament eventually turns into praise but there were instances when prayers were not answered. But how the believer's heart is transformed (still faithful to God despite struggles) is one of the core messages of the book. The verses are also applicable with today's modern world and anyone going through some tough time in life can relate and be blessed by the message of the book. Life on Earth, even for those who believe in God are not full of roses. In fact, everyone (believer or not) will still experience trying times. Lastly, we are encouraged to be honest with God and to pray, regardless of how you feel. do you know where I can find a print copy of this book? I am not sure if printed copies are available in the US though but you can try contacting the publisher OMF Literature at http://omflit.com/ .